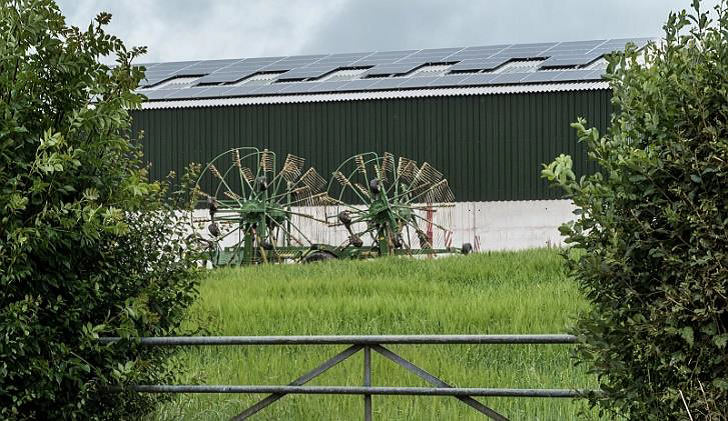 Members may recall that back in May 2016 we offered fixed term Investment Opportunities to members, rather than obtaining commercial loans, at the time the SHARE Church Park Solar PV installation was nearing completion, and again in 2018. Members were able to directly support SHARE’s aims and the Church Park project, and benefit from a preferential interest rate. At the same time, SHARE was able to obtain funding at lower cost than would have been possible from banks, and the full financial benefits remain within the community. Our 40kW solar installation at Church Park was fully funded by members. Since then, routine interest has been paid, and some loan capital has been repaid. The next substantial repayment of capital is due in June this year. Therefore we are now able to offer a new opportunity for Members to invest in SHARE by providing new loan funding. The Directors would like this new investment opportunity to be spread as widely available as possible. Full membership is open to anyone who lives, works or owns property in South Hill, and Associate membership for anyone else interested in our work. This entry was posted in Advertising/Business, Clubs/Groups, Community Energy, General Interest, In South Hill Parish on April 13, 2019 by SAS. Parish Council meetings are held on the third Tuesday of each month at 7.30pm. Members of the public are welcome to attend to address the council at the start of the meeting with any matters or questions or just sit in and stay for the meeting or leave at any time. Parish Hall Refurbishment The Parish Council has worked alongside the Parish Hall Committee to obtain funding to carry out some refurbishment works. The Hall will be closed for up to six weeks when a new hall floor and heating system will be installed. Grant funding has been obtained to cover most the costs. There is a small amount of ground works required for the heating system so this will involve closing the recreation field while a trench is dug and pipes installed. Notices will be displayed on all entrances but limited access will be allowed to the children’s play area. Although this may cause some inconvenience for a short period of time, the work will give us all a much improved hall for the future. The next Parish Council meeting on the 16th April 2019 will therefore be held at St Sampsons Church; same time 7.30pm. Please get in touch if you have any questions. This entry was posted in General Interest, In South Hill Parish, Parish Council, Parish Hall on March 29, 2019 by SAS. Some of you might not know what Face Yoga is, others may already know or might have seen the recent programme on TV Twinstitute where the twin doctors tried Face Yoga and a £1000 facial and scientifically tested the results. 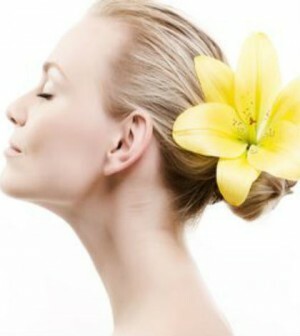 In just one month Face Yoga made them look 3 years younger than the £1000 facial! Weekly classes are starting at The Old School, South Hill Parish Hall, Golberdon and Pensilva Hall after Easter. The classes are run by Lilian Jones. It combines facial exercises, acupressure, massage, relaxation, breathing and visualisation techniques for your mind, body and soul. It’s a natural way to make you look and feel younger and healthier. As an aromatherapist Lilian will mix specific oils that improve the quality of your skin. Lilian has been practising yoga for nearly forty years and a teacher for about fourteen years. So Face Yoga is putting all the skills into practice. Come along and do something for yourself. Relax and look forward to more youthful looks as you turn back the age clock. Classes cost £6 each or £50 if you book 10. 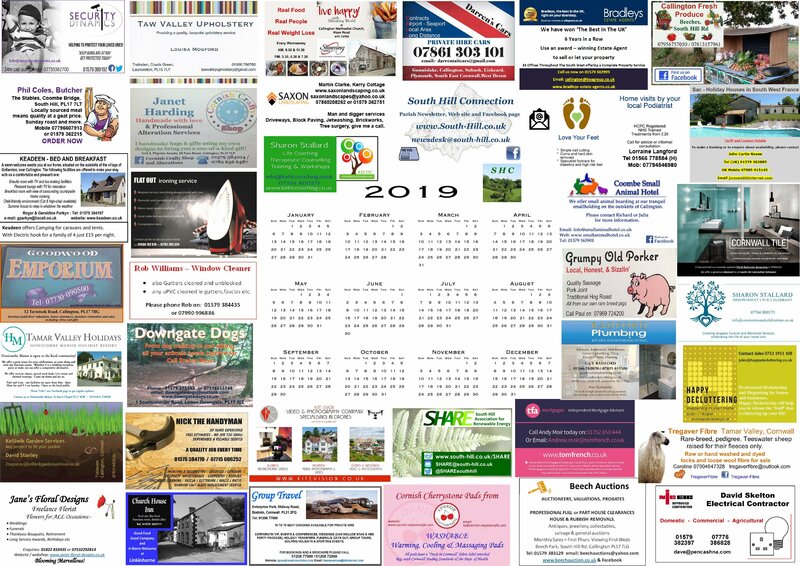 This entry was posted in Advertising/Business, Clubs/Groups, Health & Wellbeing, In South Hill Parish, Parish Hall on March 29, 2019 by SAS. 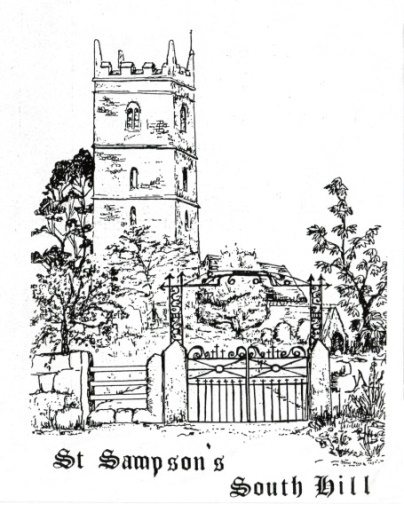 There has been a Christian presence in South Hill, serving this local community for over 1000 years, and St Sampson’s Church at South Hill is a special place for many people. At the community meeting in November people gave over fifty reasons why St Sampson’s is special. These included: ‘a sacred space of Christian worship’, ‘family connections’, ‘the heritage’, ‘part of our history’, ‘a peaceful haven’, ‘thriving congregation’, ‘focal point and heart of the community’, ‘another venue for community use’, ‘a beautiful place of friendship and joy’, ‘a community asset’. Our parish church is a Grade 1 listed medieval building. It has a wealth of history attached to it, including being the possible site of the monastery founded by St Sampson in the 6th century and having been Bishop Trelawney’s first parish. There are lots of things of historical importance both inside and outside the church, such as the 6th century standing stone, the carved apostles on the tower, and the font, which was part of an older church on the site. At the moment the church is open during daylight hours for anyone to visit and it is an oasis of peace. It would be a such a shame if it was lost to future generations. This entry was posted in Church, Fundraising, General Interest, In South Hill Parish on March 29, 2019 by SAS. Time to clear out your shed or loft? 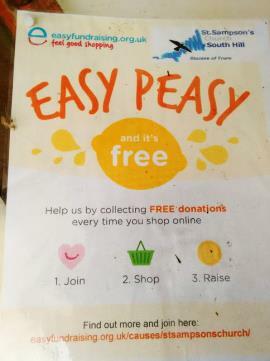 Don’t skip it, Your junk might be someone else’s treasure and it could raise much needed funds for St Sampson‘s Unlocked Project. Beech Auctions have kindly agreed to sell items in aid of St Sampson’s Church. This will all help towards making the Church, warm, dry and draught-free with a toilet and kitchen facility. All you have to do is take your items to Beech auctions (see their web site for details of when http://www.beechauctions.co.uk) and tell them it is for St Sampson’s. Or give me a ring or e mail and if it is not too big I will collect it. Please sign up if you shop online. Every little helps, it really is easy and costs you nothing. Are you able to donate a prize for the Tombola Stall please? Prizes required– from shampoo to champagne, preserves to prosecco. Donations gratefully received – food items such as cans of soup, sauces, noodles, pasta, etc. also small gifts. We’re delighted with the Connection newsletter and THANK our advertisers for their continued support, please support them by using their services and telling your friends. The Community Christmas Party this Sunday 16th, has been cancelled, Santa will be at St Sampson’s 10 – 11am for Messy Tingle. These items can recycle at the bin outside the parish hall , Tesco Callington, St Sampsons, Trevigro bench and will be sent to help charities. Biscuit and crackers wrappers including individual wrappers like penguin and now cake slices. This entry was posted in Advertising/Business, In South Hill Parish on December 15, 2018 by AH. This entry was posted in Community Energy, In South Hill Parish on November 29, 2018 by AH. A great turnout with a packed hall and apologies from another 30 people who couldn’t be there. 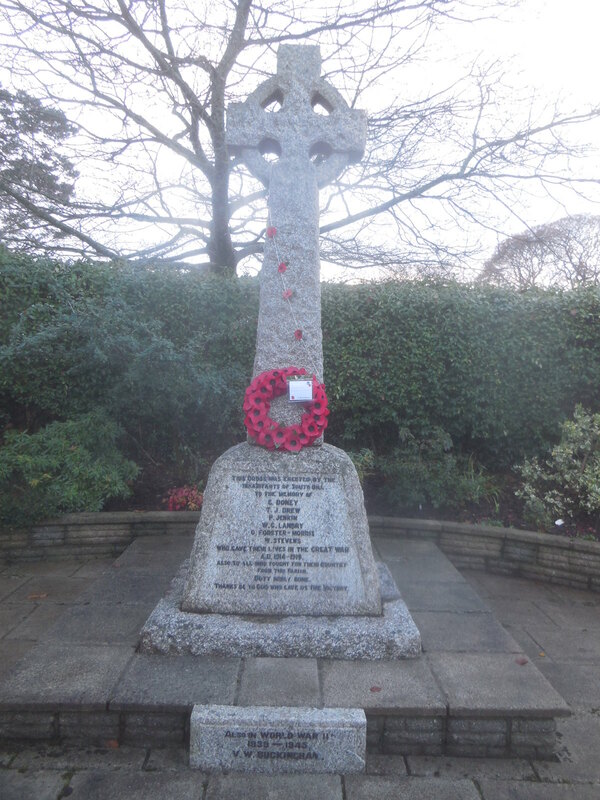 There were representatives from; The Parish Council, SHARE, WI, Horticultural Society, St Sampson’s PCC, Golberdon girls’ choir, Hall committee, Zumba group, playgroup and from neighbouring local churches. Many thanks to Rev Annabel King who started the meeting and Simon Crosbie from the architect team and Peter Tulloch our photographer. It was a very productive evening, with lots of support shown for the project. The meeting began with a rousing rendition of the Cornish anthem “Trelawney” and we enjoyed seeing the amazing painting of Lady Trelawney which was kindly lent to us for the evening and the image of Bishop Trelawney given with kind permission from Truro museum. The importance of these esteemed figures being that South Hill was Bishop Trelawney’s first parish when he became a parish priest. Our fabulous quilt depicting St Sampson, made by the South Hill Piece makers group was also displayed along with a wonderful banner created by the local toddler group JAMM. This entry was posted in Church, Fundraising, In South Hill Parish on November 28, 2018 by AH. My name is Caroline, I’ve recently moved to Golberdon with my dog Eliza. I’ve achieved a dream by buying some land in Latchley, much neglected for many years, my priority is to improve the ground. I’ve worked with goats, and intend to get some Angoras in the near future, but for now I’ve decided one of the ways to begin land recovery, was to get some sheep to graze! I’ve worked with sheep before, and when I started to look into breeds, I just fell in love with the fleeces of UK rare breeds, and settled on a small flock of pedigree Teeswater sheep and I’m now venturing into wool production. This entry was posted in Advertising/Business, Animals, Farming, General Interest, In South Hill Parish, People on November 28, 2018 by AH. Private John Garfield Doney Aged 21 The London Regiment. Son of William & Martha Doney, Wagmuggle. Private Percy Jenkin Aged 22 The Duke of Cornwall’s Light Infantry. Before enlisting, he lived at Manaton where he worked as a waggonner. Private William Gordon Landry Aged 24 The Essex Regiment Son of William & Elizabeth Landry, Trevigro. 2nd Lieutenant Herbert Gloyne Forster-Morris Aged 19 The South Wales Borderers Only son of the Reverend Herbert and Mrs Forster-Morris, the Rector of South Hill. Private William Nicholas Stephens Aged 28 The Duke of Cornwall’s Light Infantry Son of Stephen and Harriet Stephens, of Pear Tree Row, Callington. Sapper Vernon William Buckingham Aged 21 The Royal Engineers Uncle of Jill Reynolds & Shirley Shears. Able Seaman Stanley Jenkin, brother of Percy Aged 18 Lived at Trewassick where he looked after the cattle. Read more here. Aaron Rogers Petty Officer on HMS Vivid died aged 40, both are buried in South Hill churchyard. Their graves can be found next to each other in the row of graves nearest to the road wall. 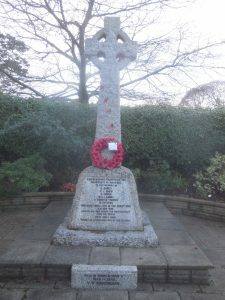 This entry was posted in History, In South Hill Parish, Parish Council on November 26, 2018 by AH.